this is your “wy” 225 Wyman is a 6-acre, 500,000+ SF Class A office and life science destination will provide a fulfilling work environment and will ultimately be “wy” future tenants and their employees will be excited to come to work each and every day. Publisher’s Note What is vision? It’s the why behind your actions. It’s the heart behind your company. It’s why your employees never leave, and why clients keep coming back. We all have vision. It just manifests itself in different ways. This has been my industry for most of my professional life. The drive is fueled by passion and emotion and has allowed me to continue to create an evolving publication for the New England marketplace. 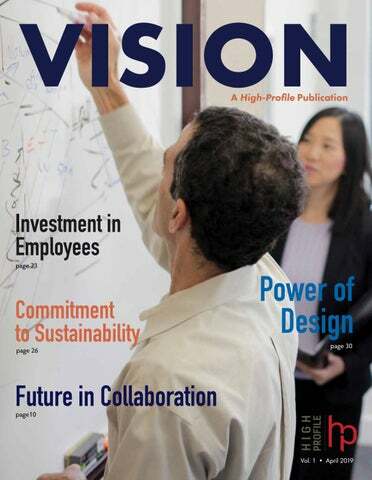 HP’s VISION issue humanizes the A/E/C/O industry and spotlights individuals and organizations that are building a better industry: implementing mentorship programs, diversifying workforce, reaching out to the community and/or local students, integrating art into design, building sustainable workspaces, embracing emerging technology, and investing in education and training. Sometimes vision includes bringing in experts to provide an objective viewpoint. This issue could not have come to fruition without the guidance of Fathom, the future design firm that helped High-Profile find its true mission, which is to provoke people to act on their vision to build a better world. We would like to give a special thanks to those who submitted content and supported the pages of this issue! We would love to incorporate these types of stories into the monthly issues of HP and evolve VISION into a quarterly publication. No time to waste! Meet the people and companies most active in New England’s A/E/C industry. Participate in VISION. Reach out to publisher@high-profile.com for more information. Why keep a low profile? StageCoach Improv at play with participants from Edmunds.com. Where are we and where can we go? The skyline is the storyline. Architecture tells a story “one story” at a time. (OK, I couldn’t help myself.) It conveys messages, evokes emotion, and leaves an impression. That floored me! Buildings tell stories from vision to creative design, foundation to rooftop garden, and people to imaginative meeting spaces (bagels and coffee optional). Overthinking choices and decisions can be detrimental to our creative flow. Think about it. gives us a false sense of control and stifles our ability to let go and profoundly engage our higher-self. Improv enables us to live in a judgment-free zone, build on what’s happening in the moment, and lovingly nudge our inner critic’s comparisons and judgments out of the way. It’s time for your inner critic to know it’s reign has ended. And scene! Neuroscience of improv: When we let it all go and not judge any of our impulses, this allows for more self-expression to light up in our medial prefrontal cortex and silences the inner critic in our dorsolateral prefrontal cortex. Awareness is the first step to identify and let go of our inner critic. Identify the cause of our vulnerability and acknowledge those feelings will initiate change and progress. Improv will clear out the inner critic and energize our forward momentum. It encourages us to listen with all our senses and build on each other’s ideas one moment at a time. We acknowledge without judgment, ego, or planning ahead. Onward and upward! The tenet of improv is “Yes . . . and.” This principle provides a platform to share and build on ideas while eliminating judgment. Yes opens possibilities, while no or but shuts down collaboration and impedes progress. Leave the butts in the chair! On-your-feet experiential learning while laughing helps us better navigate the unexpected by checking our egos at the door. Our intention should be to cultivate a strong sense of self-expression focusing on what matters the most in each and every moment. By completely surrendering to what’s happening and being aware of the environment and our emotional state, our chances of being deeply immersed in a flow-state (AKA being in the zone) increases — where performance, comedy, and creativity thrive. When we live in a mental state of flow, every thought, word, and action feels effortless. Our talent shines and time does not exist. Flow can elevate performance in a variety of areas including learning, coaching, presenting, athletics, and artistic creativity. It’s about giving yourself permission to reach the roof top one floor at a time. When we trust ourselves and completely surrender to our authentic voice while muting the inner critic along the way, we will truly live in a flow-state. Power up! « Rob DiNinni is principal and founder at StageCoach Improv, a Boston-based firm delivering dynamic and interactive improv for business, training, and entertainment nationwide. by all involved in the A/E/C industry will be critical, and complete reimagining may be required. To that end, the 10th annual Visionaries Forum will bring together another esteemed cast of industry experts. Chris Toomey of McKinsey & Company, Roberto Bicchiarelli of Permasteelisa, Fiona Cousins of ARUP, Jon Pickard of Pickard Chilton, and Fady Saad of MassRobotics, will engage in a far-reaching discussion of where we are today and where we might be headed as we continue to infuse our practices and processes with more and more technology. Please join us at the Construction Institute’s 10th annual Visionaries Forum. This hallmark event has become a premier gathering for the A/E/C industry. Learn from pioneers who are shaping the future of design and construction and changing the way the built environment will be managed in years to come. « Steven G. Haines is director of technical operations at BVH Integrated Services. Finding your Heart: The Conversation of Architecture In June 2016, Barry Svigals retired from the Connecticut-based architecture firm he had founded 33 years earlier, leaving a distinct legacy of expressive sculptural artwork uniquely created for each commission. The question for Svigals + Partners, like many firms facing the departure of a visionary leader, was how to carry on a successful practice that was so deeply shaped and nurtured by the founder. Speaking with Svigals, along with Marissa Dione Mead, newly named director of art integration, and Julia McFadden, associate principal, we hear how they each found their commitment to a practice of architecture + art. her design thinking. Joining the Kent Bloomer studio, Mead leveraged those early tinkering skills to learn detailing and fabrication techniques for custom ornamentation and public sculptures. Upon returning to Svigals in 2014, Mead aimed to expand the process of art ideation through collaborations with a variety of artists and artisans, as well as deepening the firm’s public engagement process. Reflecting on the firm’s recent pro bono project to create a memorial garden for victims of gun violence, she notes that you can’t go too far with inclusion. Her design for the centerpiece sculpture was inspired by the intimate relationships fostered with the mothers who shared their loss of loved ones. Architecture is the conversation we have with ourselves, with each other, and with the divine. Mock-up of the “Generations” sculpture for a memorial garden to victims of gun violence – photo Svigals + Partners a study of the area’s watercourses, and the waterrelated definition of the “sandy hook,” McFadden rallied the design team for the Sandy Hook School commission to respond to water throughout the architectural expression. A rain garden spanning the entire front of the school collects roof run-off to ecologically filter it with native plants, while footbridges allow you to cross over it and enter into the safety of the school’s neighborhoodthemed layout. We are all looking for our place in the world. What these three share with others at Svigals + Partners is the commitment to utilize art as a reminder of our humanity. Architecture is the conversation we have with ourselves, with each other, and with the divine. Emily Langner is the associate editor for High-Profile Monthly. At the annual leadership challenge, senior marketing coordinator Meghan Murphy and project superintendent Jonathan Coccorese deliver their team’s solution to the real-world business challenge assigned to them. In the A/E/C industry, the results of planning, hard work, and follow-through are immediately evident in the work that is produced. The success of any business in this space has much to do with its ability to create a tangible product: an office building, multifamily residence, or school, to name a few, but it is the intangible that likely plays a greater role in a company’s ability to grow, evolve, and succeed in an industry that often depends on the strength of relationships to get things done. Brent Robertson, partner at Fathom, a future design firm helping manufacturers, architects, builders, and engineers go beneath the surface to reconnect people with what gives their work meaning and drives unprecedented performance, says that most often the biggest mistake a company or organization makes is “putting too much energy into reacting to the symptoms they are experiencing like falling margins, flaccid employee engagement, and commoditization, while still hoping for growth, expansion, and increased profitability.” He says they often react by “investing in some new ‘thing’ like a new website, employee engagement program, or new process or team, hoping for a silver bullet.” But these “things” almost always fail to make the difference because none of them are designed to address the underlying condition causing the symptom. For more than 84 years, PROCON has delivered hundreds of projects in nearly every commercial sector across the Northeast. From Maine to New Jersey, there are aviation, industrial, manufacturing, mixed-use developments, corporate office, educational buildings, and hotels standing as a testament to their success. More so, in an industry where architects, engineers, and construction management are typically separate, this company has managed to hone them as a single productive entity under one roof. This begs the question — what type of people are behind the buildings? To understand PROCON’s ecosystem, you have to start with the company’s CEO, Mark Stebbins. At the helm for over 37 years, Mark’s effervescent personality is infectious. It is not unusual to hear laughter in the hallways as he calls out greetings to employees (whom he knows by name), along with a witty comment. His apparent regard for relationships, a strong work ethic, and sense of fun, trickle down into PROCON’s economy. What follows is a leadership team of approachable executives spurring on a melting pot of industry experts, who are ready to craft buildings with a vested interest. First, according to a 2018 survey by Robert Half, job hopping is on the rise in today’s workplace and it hovers at about 33% in the A/E/C industry. But somehow, this design-build firm has managed to keep its turnover at an incredible 6% with an average employee tenure of 10 to 15 years. So how do they achieve this? and recruiting team. As the in-house planning committee, they collaborate and discuss ideas that enhance the employee experience through shared activities that bring the company together: PROCON Perks. On the monetary side, there are surprise extra paychecks and company wide annual bonuses. But on the fun side, there are plenty of large and small events designed for collective engagement. Imagine arriving at work to discover a personalized thank-you card on your desk with a keepsake expressing appreciation from your leadership team? Or, how about feasting on gourmet melt-in-your-mouth cupcakes for Valentine’s Day? And, what about new project announcement pizza parties? But some events are random. One example of this was 2017’s Solar Eclipse Day. The leadership thought it would be fun to enjoy the once-in-a-lifetime event together. Thus, on a warm August afternoon, the office (and field teams), equipped with NASA-approved viewing glasses, and bagfuls of spaceinspired candy, gathered to watch the eclipse unfold. Larger get-togethers include the annual celebration and the corporate meeting. But smaller events are scattered throughout the year, such as catered barbecues for national holidays, or the Officer’s Labor Day Breakfast where the executive team makes and serves breakfast to all the employees. The firm’s culture is intentional. It is styled to promote camaraderie while celebrating projects and the people who design and build them. The truth is, happy employees pay dividends in the form of strong relationships with clients, partners, subcontractors, and finally, in over-the-top customer service. Additional perks include the anniversary wheel (which employees spin for prizes), Summer Fridays, numerous health and wellness initiatives, and more. Then there are family fun days that include the spouse and/or the entire family (including grandchildren). Recent trips have included Canobie Lake Park and Charmingfare Farm. And, the firm does not forget its hard-working field teams, good-naturedly known as Supermen in the Field. They have enjoyed trips to Fenway Park featuring a meet n’ greet with a retired Red Sox player, time on the field, and lunch. Gillette Stadium welcomed PROCON’s field team with their names on the Jumbotron, a motivational speech by a former New England Patriots’ player, a behind-thescenes tour, and lunch. It is an ethos four generations deep, passed down from Mark Stebbins’ grandfather to the present day. For more than 60 years, the company has supported organizations to include United Way, Easterseals, the YMCA, Waypoint, and the Boys and Girls Club, to name a few. Altogether, millions of dollars have been raised via the Stebbins Family and Corporatematch donations, worksite campaigns, SleepOuts, holiday shopping, and payroll deductions. Among the company’s industry accolades is perhaps its most revealing one to date — the Business NH Magazine’s “Best Companies to Work For” award where PROCON’s employee’s anonymously voted on their culture. If two consecutive wins are not a sufficient indicator of their in-house values, then let a 95% repeat business tell the rest of the story. The truth is, happy employees pay dividends in the form of strong relationships with clients, partners, subcontractors, and finally, in over-the-top customer service. « Carol Duhart is the creative writer for PROCON Inc.
PROCON’s other compelling attribute is its commitment to giving back in the local community. and delivering value to brokers, architects, owners, developers, bankers, landlords, and tenants. We understand the balance required to plan, execute, and deliver on all sized projects while maintaining the same level of service for all of our stakeholders. We become your trusted advisors during every project. It is our mission to provide unsurpassed levels of personalized service and customer satisfaction while maintaining an unrelenting commitment to project quality. Our entire team focuses on a successful and timely project close-out with a project and a relationship that is built to last. ÂŤ Kait Kingman is marketing associate at the Hayes Group. waiting on Hampden Street as early as 5:30 in the morning for the bus to take them to their school in the suburbs. I realized this must be hard for them, especially during the harsh New England winters, so my team put a plant together to provide more than $3,000 worth of winter jackets and hats to Orchard Gardens kids at Christmas time. Now, when those same students are waiting for the bus, they’re better protected against the cold. Dana Bowman, a former Feldman summer intern Similarly, last September, we purchased and filled 130 backpacks for students at the Henry L. Higginson Inclusion School in Roxbury. Afterwards, Principal Marie E. Mullen sent us a letter, saying: “We truly appreciate all your team did for our staff and students. The students were thrilled when they opened their backpacks to see all of the fun stuff they got” On a daily basis, the employees at Feldman, myself included, are working hard to build a solid connection between business and the community. That’s what makes our vision a journey. « Michael Feldman is the president and CEO of Feldman Land Surveyors. of visionary leaders and skilled professionals. Our mission is: To provide resources and forums for crossindustry collaboration. Our signature programs — the AEC Leadership Conference, the Women Who Build Summit, and the annual Visionaries Forum — arose from the mission and vision of the institute. Our professional education programs align with our vision and mission. The focus is on leadership, communication and collaboration, and multidisciplinary conversations. That means the institute is nonhierarchical, with diverse professions represented, and professionals in diverse career stages in leadership positions, including young professionals on the board of directors. The power of our vision is something we create, contribute, and do. Our member logo allows our members to identify their commitment to the vision and mission of the institute. Our vision has inspired us to make significant changes and create new value for our members and for the industry. Our first book, “The Future of the Design and Construction Industry,” explores a vision for the future of our industry. Join us! Become a part of the next chapter. and much more. Scan the QR code for a “Quick Quote” on the best-selling wide format printers available with ON SALE PRICING. Nothing Beats Knowing. For 38 Years, The Trusted Choice of Architects, Engineers and CAD Departments Throughout New England. As the University of Hartford gears up for its 10th annual Visionaries Forum this April, I find myself thinking about the word “visionary.” To me, a visionary doesn’t just have a grand image or idea about what the future will look like but proactively works to make that vision a reality. A visionary thinks big but is also acutely aware of the smaller steps that are required to get there, which in my experience requires both a keen understanding of how things are done today as well as a willingness to get into the field (or onto the jobsite) and ask how things can be done better. For the construction industry, which is still at the beginning of its digital journey, this is a particularly relevant and important concept. As I’ve written about before, after decades of lagging technology adoption, construction contractors are turning to cutting-edge tech (wearables, equipment sensors, drones, and other connected devices) to streamline processes and unlock new efficiencies. As the Visionaries Forum so astutely highlights, each one of us has an important role to play in driving the construction industry towards a smarter, safer, more sustainable future. And while tremendous progress has been made, there is more work to be done. Being a visionary involves more than simply having an idea or vision of what the future could be like, and similarly, innovation is much more than a one-time initiative/ exercise before returning to business as usual. True vision and digital transformation challenges leaders and organizations to look within themselves and to establish the tools, processes, and frameworks necessary to unlock new insights, act upon those insights, and drive change. idea or solution is important, but it’s equally as important to remember the people and processes that will support it. Ultimately, a visionary is about more than his/ her vision, just like innovation is about more than technology, and technology is about more than the product itself. A visionary requires foresight and creativity, as well as the wisdom to know that change doesn’t happen alone or overnight. As the Visionaries Forum so astutely highlights, each one of us has an important role to play in driving the construction industry towards a smarter, safer, more sustainable future. From executives willing to champion change to project teams willing to test new solutions to industry partners shining a spotlight on all that’s happening in the industry, each of us plays a crucial role in shaping construction’s future and new digital identity. That’s the reminder and inspiration I take away from this event each year, and I hope you will too. « Pete Schermerhorn is president and CEO of Triax Technologies, Inc. and an active member of the Construction Institute, University of Hartford. READY FOR A TOUCH OF MARKETING MAGIC? It’s time to meet the wave of our wand. Design of the built environment is changing radically for three fundamental reasons: improved technologies, improved products, and improved processes. These transformative drivers have revolutionized all facets of the construction industry and every aspect of how and what we build. Through the collaboration of architects with contractors, subcontractors, and manufacturers, buildings and interiors can now be fully constructed virtually. electronic supports that permit builders to view, query, and coordinate such that conflict and waste can be eliminated. Implications for architects include the expectation that subcontractor shop drawings will arrive electronically, prepared by those most knowledgeable about and responsible for their trade. The vastly more complex products and systems require expertise that no single source can provide, and collaborative technologies (BIM 360 and others) allow each professional to refine this marvelous building model in advance of beginning actual construction. Improvements in innovation, communication, cost control, risk reduction, and outcomes assurance will be momentous. Modularity is increasingly sweeping aside field assembly. Traditionally, buildings are constructed piece by piece, brick by brick — regardless of rain, snow, or temperature. Would you buy a car built that way? Of course not; the quality would suffer too much. More and more of the components of a building are being delivered to the construction site ready for placement. These components range in size and complexity from light fixtures and unitized exterior building façades to whole buildings. Improved technologies also facilitate CAD/ CAM production directly from the design drawings. Sprinkler piping, for example, instead of being measured and cut in the field, can be shop fabricated to the precise dimensions and delivered to the exact intended location for installation. CNC machines, essentially robotic manufacturers, produce cabinetry ready for final assembly and require limited human intervention for production. Modular housing is built in a factory efficiently and safely, delivered complete with finishes, appliances, plumbing fixtures, HVAC, and sprinklers fully tested to unequalled quality standards. Factories can actually sequence and assemble differently than what’s possible in the field, altering traditional responsibility-by-trade paradigms. Materials will be 3D printed more often as printers and printable products evolve and designers discover more opportunities. The use of mass customization is on the cusp of becoming routine practice. Why must all bricks be rectangular? Instead of using rectangular molds, what if molds could be easily and inexpensively created via software/robot interface such that bricks could be any shape we want? Materials will be 3D printed more often as printers and printable products evolve and designers discover more opportunities. Building mass was previously part of how material performance was measured; now lightweight, highly engineered assemblies and materials are crafted according to highly specialized characteristics at a nanotechnology level. Building integrated photovoltaic glazing (BIPV), which transforms entire surfaces of buildings into solar energy collectors, is an example of the highly integrated multidisciplinary nature of materials that now combine the characteristics of transparency, insulation, waterproofing, building protection, and electrical integration in ways that simpler materials never did. By its very nature, the traditional model of designbid-build tends to cultivate mistrust. Today, clients want to work with building teams focused on delivery of the best product for the best price. More innovative contract models, such as integrated project delivery (IPD), create a relationship where the owner, designer, and contractor are all legal clients of the project, sharing liability and reward. There are many other team formats — designbuild or design-assist, for example — that establish relationships that are highly collaborative and mutually respectful. While the architect used to be the “master builder,” the ubiquity of the owner’s project manager (OPM) now means that traditional roles have been upended. Some companies will even assume responsibilities for everything from leasing of premises to delivery of furniture, IT, and AV in addition to design and construction. New FASB accounting rules dictate recognition of construction costs far earlier than previously done. The response by corporate tenants (who represent 50% of building users) has been to negotiate that building owners assume responsibility for design and construction through turnkey deals that further blur the lines of direct accountability. If the relationships between industry professionals are contractually different, altered processes must result. Architects wonder about the future of the profession. The adoption of innovative technologies, incorporation of specialized products, and embrace of more-collaborative processes can either help the discipline flourish or relegate designers to the junior position of façade decorator. Creating unique, oneof-a-kind buildings can be inefficient, risky, and expensive, yet construction is one of the greatest and most noble creations of humankind. How will we choose to build in the future? « Marc Margulies, FAIA, LEED AP, is a principal and senior partner at Margulies Perruzzi, one of New England’s top architectural and interior design firms. Together more is possible. Listen & Learn. Creativity is in all of us. Unleash your potential. Stoke your compassion. Elevate communities to thrive. Design inspiring places for living & learning. Experience the Revolution. Suffolk is leading the transformation of the construction industry with technology and process innovations that boost predictability, accelerate schedules, eliminate costs and minimize waste. Our “build smart” approach is sparking an industry revolution. ŗ ),ŗ3)/,-& at su olk.com. different people in three different departments (project management, finance, etc.) collecting the same data and recording it. Through internal feedback from the employees who deal with this data every day, we were able to identify these redundancies and streamline the process. The input from the finance coordinator, saying, “We actually have this information already but it’s not easily accessible,” was invaluable to improving this process and would have been overlooked if we hadn’t given her a voice. We firmly believe that our employees should be empowered to identify what needs to be done on a given day. Interstate’s workforce has the freedom to say, “We can do this a little bit differently,” or, “We want to try something new.” Even if the suggested change makes their job 5% easier, they know their input is recognized and valued. Not every experiment is successful, but we only get stronger by evolving our thinking, examining each process, and assessing the end goal. It’s rewarding to see our employees rise with us. « Luiza Mills is VP of human resources at Interstate Electrical Services, Inc.
Past exhibition “Light Traces” featuring artists-in-residence Ian MacLellan and Jenn Wood. receive full access to a studio workspace, fabrication and welding resources, exhibition opportunities, and a stipend for supplies. “You + Me” mixed media installation by former artist-in-residence, Jenn Houle. Former artist-in-residence, Jenn Houle, leads a group of students in one of the Plumbing Museum’s signature children’s art classes. involving the local community with new exhibitions, attracting a more-diverse mix of visitors, and cultivating community partners. For example, the museum has become a popular spot for local homeschool field trips. In Massachusetts, there are approximately 30,000 kids that are home schooled, and many families join local homeschool communities to attend group field trips and other extracurricular activities. Responding to the demand, the Plumbing Museum proposed to design a series of extracurricular art and music activities for the homeschool visitors in an effort to increase community outreach. The proposal was submitted to the Watertown Community Foundation, and the museum was awarded an Institutional Support Grant. Children’s art classes and music events emphasized creative problem-solving and experimentation and included activities in drawing, painting, sculpture, and mixed media. The outcome of this grant project exceeded expectations. The Plumbing Museum engaged strong participation in all the project activities and proved itself as an adaptable venue for diverse community programming. The long-term strategic plans are to continue building relationships with peer organizations, organizing and hosting special events, and developing the Plumbing Museum as a place for discovery, inspiration, and learning. « Sasha Parfenova is the museum program manager at The Plumbing Museum located at J.C. Cannistraro’s headquarters in Watertown, Mass. Visitors looking at pinhole and cyanotype prints at the exhibition opening of “Light Traces” in the Plumbing Museum. Former exhibition “Industrial Nature” featuring artists-in-residence, Jenn Houle and Joshua Ruder. Best Practices in Sustainable Office Development by Bradley Cardoso If you’ve driven along Route 128, then you know construction activity is at an all-time high. According to the Boston office of Cresa, flex product in the suburban 128 market remains tight, as tenants’ need for clear height and highway access continues to gobble up viable alternatives. Class A, amenity-rich properties and office parks will continue to command high rents as tenants’ willingness to pay premium numbers persists. Current sites under development along suburban Route 128 include: 1.79 million sf of permitted development; 1.25 million sf of nonpermitted development; and 795,000sf under construction. Since 1952, Hobbs Brook Management has developed and managed Class A office buildings in Waltham, Mass., and beyond. In fact, we were the first to build an office building on Route 128 in 1954, and today we own and operate 14 buildings comprising two million sf in Waltham alone. Enticing financially strong companies into a building — and keeping them happy — is a top priority for developers and property managers. After almost 70 years, we’ve learned much about developing sustainable office buildings to meet tenants’ needs. We recently announced plans to replace the buildings at 225 and 235 Wyman with a 500,000sf new office and lab development located immediately off Route 128 in Waltham. When complete, the five-story building will be the largest contiguous Class A office building along Route 128. Designed by Gensler to meet LEED Silver certification by the United States Green Building Council (USGBC), it will be lab-capable to satisfy both laboratory/ research and development, and traditional office needs. The site offers direct access to Route 128/95 via the Wyman Street on-off ramp and will include food court-style dining facilities, an onsite gym, and a conference center. JLL has been selected as the exclusive leasing agent for the property. The site’s landscape plan, designed by OJB Landscape Architecture, will include both paved and permeable walkways, seating areas and walking trails in the beautifully landscaped Western Courtyard, as well as an arrival courtyard at the entrance to the building. To complete the existing walking trail that runs through the Hobbs Brook Office Park, an additional 1.8 miles of trails and three acres of outdoor activated space will be added adjacent to the new building at 225 Wyman Street. The project will also feature a new fivestory parking garage with 1,500 spaces, including electrical vehicle charging stations, plus 221 surface spaces. Construction should begin in the second quarter of 2019 with the building ready for interior fit-out by the end of 2020.
buildings possible. Not only does it benefit the environment, but it greatly reduces costs for our tenants. For example, at 275 Wyman Street designed by Margulies Perruzzi and built by Commodore Builders, both the base building and interior fitout achieved LEED Gold certification. The use of a unitized metal and glass curtainwall system for the building’s envelope provides high thermal efficiency and allows daylight to filter deep into the building’s interior. A 561-kW solar array installation on the covered parking structure will generate about 673,000 kwh of power per year. Our philosophy regarding development has always been to build the highest quality and most sustainable office buildings. As we maintain these buildings ourselves, it just makes sense to leverage the most sustainable construction methods currently available. We design and construct buildings we’d want to work in ourselves, and in fact we do. We wouldn’t have it any other way. 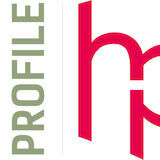 « Bradley Cardoso, AIA, is principal architect, Hobbs Brook Management. Making Bold Choices to Attract and Retain Top Talent While Managing Change by Jenny Drescher and Ellen Feldman Ornato Have you ever heard someone complain that company change is top-down, that leadership is setting visions but not realistically accounting for how employees will execute? Disengagement and cynicism happen when people receive mandates for change or improvement but lack the skills and resources to create the desired results. Pair this with human nature that resists change and the unknown, and the implementation of strategic, mission-driven work is at risk if behaviors and mindsets don’t shift towards the desired visions. and proactively identify broader opportunities, ask more-effective questions, and become less reactive in challenging situations. They lightened up, started adapting, and began viewing themselves as profitcenter leaders, not just managers. Bonds developed between participants, many of whom had only known each other as peers at meetings. Across the organization, teams report a higher level of cooperation, more productive relationships with their direct reports, a willingness to share best practices, and a desire to continuously support each other. These relationships stabilize the company’s regional stronghold and position it for future growth and success. Senior leadership participated with their people, learning alongside them and cultivating trust. The company has started the essential journey of bravely reshaping their culture to take it into the future. How does a nationally recognized leader in electrical parts distribution build rapid, sustainable capacity so that employees can and will embrace change and tackle new challenges? Sales and management associates’ skills of this regional powerhouse lagged behind the competition. Team members focused on transactional versus relational selling and were described as “old school” by leadership. With change afoot throughout the industry, the company recognized a pressing need to develop their organization’s client-facing teams, to strengthen existing client relationships, retain market share, and build capacity within its employee groups. The leadership team took a deep breath, realizing they needed to think differently about developing their people and their culture. They took a hard and sometimes uncomfortable look at their processes and environment. What they discovered was the effects of rapid change that had spurred growth but left its workforce feeling overwhelmed and distrusting of leadership. Employees were waiting for the next operational, technological, or promotional change to come from on high, and too often found themselves unable to execute these changes effectively. The bold move leadership made was simple: to see themselves through honest eyes, instead of blaming employees, and start trying on fresh solutions to engage, develop, and, ultimately, keep their talent. Enter the skills of improvisation. In the theater, improvisers practice a variety of skills through play to create performance. These same skills are at the heart of leadership and teaming, innovation, and client care, including such areas as: • Intense and intentional listening. • Seeking value in others’ contributions, building agreement. • Creating a productive relationship to risk and failure. • Spontaneity, flexibility, and situational awareness. • Elevating others and collaborating to create. • Lightening up and having fun. said: “If it falls your lot to be a street sweeper, sweep streets like Michelangelo painted pictures . . . Sweep streets so well that all the hosts of heaven and earth will have to pause and say: Here lived a great street sweeper who swept his job well.” Notice he did not say a good street sweeper; he said a great street sweeper. That’s what we strive to be — exceptional. Always. We are big believers in measurables and metrics — they serve as a baseline from which we launch ambitious goals and measure our progress. But we are wary of industry standards because they are the blueprints of mediocrity. Imagine a company whose highest aspiration is to be “as good” as their competition. We do not want to act as the industry expects. Our approach is to do what is right, innovative, disruptive, challenging — and again, big and bold. Clients need, want, and deserve advisors who bring something bold to the table. In 2017, we made a commitment to empowering our people to become their best selves by offering a myriad of wellness, enrichment, and educational programs: work force training, lunch-and-learns, social offsites, company retreats, charity activities, generous benefits, fitness experts, financial consultants, life coaching, and relationship and team building. As a result, many employees changed their lifestyles to include more meaningful and impactful activities. In the 2018 Boston Globe “Top Places to Work” issue, office manager Maureen Hopper and COO John Lawlor were featured in an article highlighting Maugel’s best-self program. The article focused on how Maureen prioritized time to help her son prepare for college, joined a Pilates class, and improved her diet. She is now less stressed, with more energy and a renewed enthusiasm for her career. « Brent Maugel is the founder and president of Maugel Architects, a Harvard, Mass. firm that recently celebrated its 25th year. missed out on earlier in life as struggling addicts. Argus says the results of the program have been phenomenal. He emphasizes that it is the participants themselves who will ultimately determine if they will be successful at turning their lives around, including his own family member who is also a part of the program and has been at Karas & Karas for two years now. Argus says the program merely gives them a lifeline and the resources to make that success happen. When an addict has decided they are done and that they want to make a change, he says, it is providing a supportive environment and the structure to succeed that David Argus really makes the difference. As a result of the program, Argus says the culture at Karas & Karas has also changed. The mindset has shifted from that of judgment to a true desire to help promising, talented, and hardworking people continue to succeed and overcome the disease of addiction. His goal is to make sure that when someone is ready to get sober, there are resources and people available to help them succeed. Argus will be at the Building Trades and Recovery Week from April 29 to May 3, an event put on by the Building Trades Employers’ Association. He will be holding workshops to help spread awareness and to educate people on how to best work together to combat the epidemic. For more information, visit www.btea.com. and protecting new and existing buildings from the impact of fire & smoke, air, water and sound – including firestopping, air & vapor barrier, waterproofing, and caulking services. We provide professional expertise on new construction and renovation projects for commercial, healthcare, life science, institutional and municipal clients. Design Thinking Prepares Kids for a Complex World by Polly Carpenter Boston is an old seaport city facing major challenges that include housing shortages, climate change, sea level rise, aging infrastructure, and escalating carbon emissions: challenges that can be addressed using design solutions. The Boston Society of Architects/ AIA and the BSA Foundation (the BSA) recognize that the scale of these challenges ensures that they won’t be solved quickly or easily, and will ultimately be managed by the next generation. So how can we be sure that the next generation will be up to the task? The BSA, which has its headquarters at BSA Space in Fort Point Channel, believes that by giving kids design skills, they will be empowered to analyze conditions, envision solutions, advocate for, and work on the creation of safer, healthier, more resilient, and equitable communities. Training kids to think like designers teaches them critical skills such as how to evaluate, synthesize, collaborate, and how to use creative problemsolving when confronted with real-world dilemmas, including those they’ll encounter in school and in the 21st century workforce. KidsBuild! was launched by the BSA at the Museum of Science in 1992 to do just that. At that first event, volunteer architects surrounded by a pile of recycled materials from their offices led hundreds of children on an adventure that resulted in the construction of a kid-sized city. But KidsBuild! has never been just playtime. KidsBuild! presents young designers and their families with the opportunity to work through real challenges and real processes. Young designers start at the building department where a volunteer architect assists them in choosing a site from a city map and selecting a building type; then the volunteer grants them a building permit. Next, children visit the city layout — which for the last seven years has been in the atrium adjacent to BSA Space — and begin drawing their buildings. architects to share their unique skills with kids and it’s a chance for kids to learn directly from people working in a field that might not otherwise be presented to them. The BSA believes in the power of design to solve problems, and in the power of young people to make great choices for the future. It’s a complex world they are growing into, but by sharing the power of design, we are preparing kids to meet their challenges. KidsBuild! took place April 6 and 7 at BSA Space. It was a sold-out event that was bustling with over 700 K-12 kids and their families and guided by 70 volunteer architects. A parent and child design together at KidsBuild! – photo by Mike Lawrie Also in 2019, KidsBuild! goes on the road, visiting two community locations so more children throughout Greater Boston can be served. Boston Properties and HMFH Architects are lead supporters of youth design education through their “Provoking Change” membership of the BSA Foundation’s Legacy Circle. KidsBuild! On the Road is sponsored in part by Eastern Bank. The Boston Society of Architects is the local chapter of the American Institute of Architects. The BSA Foundation is a 501c3 charitable organization. To learn more, including dates for KidsBuild! on the road, visit www.architects.org/kidsbuild. « Polly Carpenter, FAIA, is the director of Public Programs at the BSA Foundation. Do what you say you will do. Be present. Nothing builds a relationship faster than face-to-face, and nothing destroys it faster than failing to deliver on a commitment. If you commit to a networking organization, be consistent in your attendance. Spend time with your colleagues. Return phone calls and emails faster than expected. Recognize that nothing reduces a client’s stress like a deliverable that arrives early. Move like there are a limited number of hours in the day. Think about what is the most important thing for you to do next. Do not procrastinate. Ask questions. Read a lot. Be open and humble. Contemplate problems. Have interesting conversations with clients, colleagues, and the person next to you on the plane. The design-build field is a place where curious people thrive. Pressure makes diamonds, but let’s be honest; no one cares how diamonds are made. Everyone is busy and stressed — the best make it look easy. SCI’s focus on a collaborative approach to energy-efficient design and construction helps create buildings that maximize the value of the building for the owner and the quality of the environment for the occupant. SCI takes responsibility for the incentive process and leading the project team through the implementation of energy-efficient construction. submitted by Sustainable Comfort, Inc.